The United Nations Security Council expressed concern on Friday about military activity near Libya’s capital Tripoli, warning that it threatens the country’s stability, and called on Libyan National Army (LNA) troops commanded by Khalifa Haftar to halt all military movements. “They (the council) called on LNA forces to halt all military movements,” said German UN Ambassador Christoph Heusgen, president of the council for April, reading a statement agreed by the body after it was briefed behind closed doors on the latest developments. “They also called on all forces to de-escalate and halt military activity. There can be no military solution to the conflict,” he said. In a dangerous thrust against Libya’s internationally recognized government, eastern Libyan troops commanded by Haftar said on Friday they had advanced on the southern outskirts of Tripoli, with fighting continuing near the former international airport. The moves by Haftar’s army, the LNA, which is allied to a parallel administration based in the east, escalated a power struggle that has splintered the nation since the overthrow of MoammarGadhafi in 2011. The development comes as UN Secretary-General António Guterres said Friday he was “deeply concerned” after meeting Haftar in Libya to try to avert a renewed civil war as forces advanced on Tripoli. Haftar, 75, who casts himself as an opponent of Islamist extremism but is viewed by opponents as a new Gadhafi, was quoted by Al Arabiya TV as telling Guterres the operation would continue until terrorism was defeated. The LNA said in the evening it had taken control of Tripoli’s airport. The coastal capital of Tripoli is the ultimate prize for Haftar. In 2014, he assembled former Gadhafi soldiers and, in a three-year battle, seized the main eastern city of Benghazi. This year, he took the south with its oilfields. “I leave Libya with a heavy heart and deeply concerned,” Guterres said on Twitter. I leave Libya with a heavy heart and deeply concerned. I still hope it is possible to avoid a bloody confrontation in and around Tripoli. <br><br>The UN is committed to facilitating a political solution and, whatever happens, the UN is committed to supporting the Libyan people. The escalation surprised the UN. Guterres had been in the capital this week to help organize a national reconciliation conference planned for later this month. But on Thursday, LNA forces took Gharyan, about 80 kilometres south of Tripoli, after skirmishes with forces allied to Tripoli-based, UN-backed Prime Minister Fayez al-Sarraj. They moved further north, coming as close as 40 kilometres to Tripoli by taking the village of Suq al Khamis after some fighting, a resident and an eastern military source said. In the evening, the LNA said they had taken control of the areas of Qasr bin Ghashir and Wadi al-Rabie on the southern outskirts of Tripoli, near the airport, closed since a city battle in 2014. It could not be independently confirmed, but a video posted online purportedly showed LNA fighters inside Qasr bin Ghashir. However, the Tripoli interior minister, Fathi Bashagha, later told Al Ahrar TV his forces had retaken the old airport, while there were clashes in the Qasr bin Ghashir area. Major ministries are still 20 kilometres away. In an attempt to close the coastal road to Tunisia, Haftar’s forces failed to take a checkpoint about 30 kilometres west of the capital. An LNA-allied armed group withdrew overnight from so-called Gate 27, leaving it abandoned in the morning, a Reuters reporter said. In another setback, forces allied to Tripoli took 145 LNA fighters prisoner in Zawiya, west of Tripoli, a western commander, MohamedAlhudair, told Reuters. An LNA source confirmed 128 had been captured. Sixty vehicles had also been seized, Alhudair said. Meanwhile, armed groups allied to the UN-backed Tripoli government moved more pickups mounted with machine-guns from the coastal city of Misrata to Tripoli to defend it against Haftar’s forces. 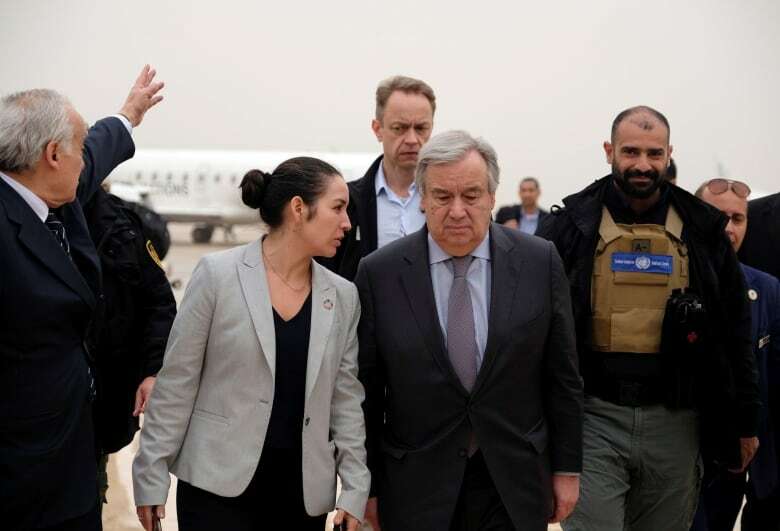 Guterres, who spent Thursday night in the heavily fortified UN compound in a Tripoli suburb, flew to Benghazi and drove to Haftar’s base, witnesses said. The offensive is a setback for the United Nations and Western countries trying to mediate between Sarraj and Haftar, who met in Abu Dhabi last month to discuss a power-sharing deal. The conference the United Nations wants to organize is meant to forge agreement on a roadmap for elections to resolve the prolonged instability in Libya, an oil producer and transit point for refugees and migrants trekking across the Sahara in an attempt to reach Europe. Haftar enjoys the backing of Egypt and the United Arab Emirates, which see him as a bulwark against Islamists, and which have supported him militarily, according to UN reports. Germany called an emergency meeting of the UN Security Council due to the military escalation. Russia said it was not helping Haftar’s forces and that it supported a negotiated political settlement that ruled out any new bloodshed. Tunisia has tightened control over its border with Libya in response to the renewed conflict, the defence ministry said.